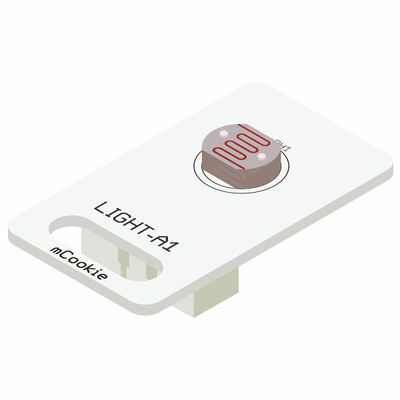 Sensor-Light-A1 is a photosensitive brightness detection sensor module. The light sensor transforms the light signal into electric signal with the photosensitive resistance. Its sensitive wavelength is near that of the visible light, including the infrared and the ultraviolet. Resistance photosensitive element, with high sensitivity. The sensor outputs the corresponding voltage according to the detected light intensity. The Light Sensor is an analog input sensor. It is able to detect light levels by using a photoresistor. A photoresistor is sensitive to the amount of light and changes its resistance based on light levels. When used in a voltage divider, different voltage levels will be produced based on the amount of light. A Core module can read the voltage value. The Light Sensor is used as an analog input pin. Therefore, the pinMode and analogRead functions will be used. This is a simple example which outputs the value of the Light Sensor to the serial port terminal. //Note: This sensor uses analog read, which means only pins denoted with an 'A' prefix will work. Click [File]->[Open], browse to the project program address, and click "Microduino_Light_A1.ino" to open the program. Referring to the following diagram, connect the Sensor-Light_A1 to the analog port A0/A1 of Microduino-Sensorhub. The value displayed on serial monitor reflects the current light intensity detected by the sensor. It can feel the intensity of light around us. It can be used to detect the light intensity, and control the indoor lighting and object shading and so on. This page was last modified on 18 August 2017, at 20:51.